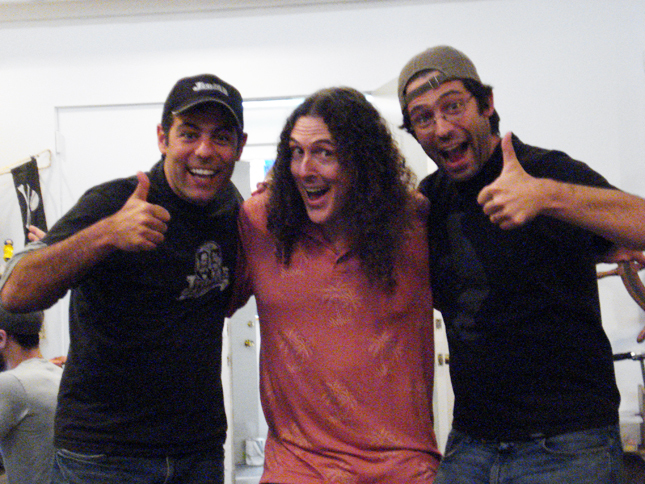 JibJab friend and collaborator Weird Al Yankovic stopped by the studio today! We’ve grown a lot since we last collaborated with him in 2006 for the music video to “Do I Creep You Out” , so we gave him the grand tour and a sneak peek at our various top secret projects in development. On top of our next big political piece, we may be doing something with Al himself this summer! No lounging around on the beach for us, we’ve got work to do. This entry was written by paulhanges and posted on May 26, 2009 at 10:10 pm and filed under Uncategorized with tags do i creep you out, jibjab, jibjab.com, weird al. Bookmark the permalink. Follow any comments here with the RSS feed for this post. Trackbacks are closed, but you can post a comment. So great to hear from Weird Al again. Has he thought of re-releasing his earlier work, like “Going Belvedaire Crusin’ Tonight “?? Does JibJab have a Three Stooges video where you can insert photos for the stooges?